A new development in hypercoordinated carbon research as Kin-ya Akiba of Hiroshima University together with team from 5 other research institutions announced a novel organic compound with a hexacoordinated carbon atom (DOI). This work is basically an extension of earlier work published in 1999 featuring pentacoordinating carbon. The anthracene frames are identical and coordination partners are oxygen. 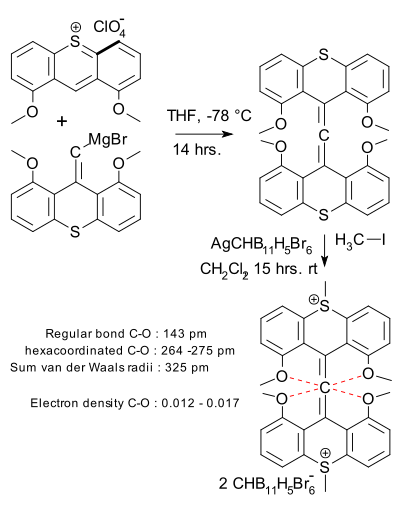 The earliest reported hypercoordinated (the phrase hypervalent is now discouraged) carbon compounds are the methanium ion (Olah 1972), an anthracene system (Martin et al. 1979 DOI), a fluorene system (Hojo et al. 1985 DOI) and a polyauriomethane system (Schmidbaur et al. 1988 DOI DOI DOI DOI ). It has also been found to exist in certain zirconium organometallic complexes (Schottek et al. 1998 DOI). Hypercoordination also occurs in carboranes and with agostic interactions. 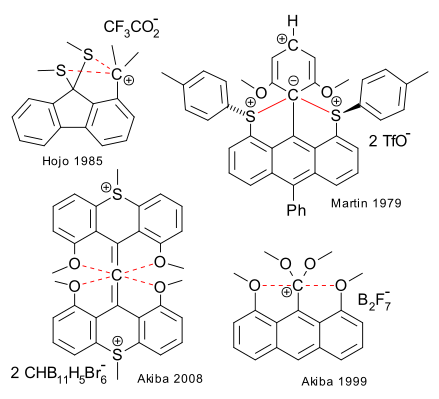 Hexacoordinated carbon is also an accepted transition state for bimolecular nucleophilic substitution. Heavier hypercoordinated silicon compounds are also known. Prerequisits for true hypercoordinated bonding are acceptable bond lengths and symmetry, which can be revealed by X-ray crystallography. In the novel Akiba work the central allene carbon atom has four neighboring oxygen atoms with nearly identical C-O bond lengths in between that of a true C-O bond and the sum of carbon and oxygen van der Waals radii. So far so good because al the previous Hojo and Martin systems, according to Akiba, fail to meet this mark. On the other hand, the electron density between carbon and oxygen as determined by X-ray analysis with synchrotron radiation is very low. Although not referred to in the article, this research is tied in with bonding in anthracene itself as discussed in Bader's Atoms in molecules theory. The allene was synthesised in a Grignard reaction followed by methylation with iodomethane and a carborane superacid.